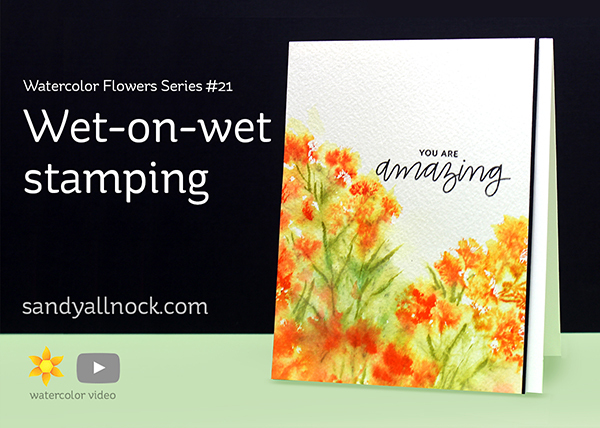 Recently I was reminded of my watercolor flowers series – and after going back and numbering the ones that didn’t make it in…we’re back on track – with #21! These watercolor flowers are easy, but look so loose and artsy – stamping with watercolor markers onto wet paper gives the flowers a washy look that can be challenging to create with just a brush! I used Zig clean color markers but you could try other brands and papers too. Watch the video below or click HERE to see it in HD on YouTube. And the soft purple flowers too…yum! These are beautiful! You make me think I might even be able to do it!! Very pretty, what size are these cards? Oh WOWZERS! Those are so beautiful! I haven’t even watched the video yet I had to comment first they are just stunning! I really enjoyed watching you make these 2 beautiful cards. I definitely want to try this because it may help me loosen up and get away from painting every petal and leaf. You definitely made it look fun to do. I am 85 yrs. old and love every minute of paper crafting thanks to you. TFS. Just beautiful. Will try this with my MISTI. U r an awesome teacher!!!! I love your Flowers Series Sandy! Always learn something from your videos! Thank you so much, cards are awesome!